RECENTLY in the news was a pilot described as “a Gisborne schoolmaster,” who performed an amazing feat of airmanship by ﬂying his ’plane back from a R.A.F. ﬂight over north-western Germany with most of the fabric torn from the wings by an explosion while the machine was ﬂying at an altitude of 2,000 feet. Some difficulty was experienced in tracing the identity of the pilot, as there was no record of any member of the teaching profession having enlisted while he was residing in Gisborne. However, a cabled remark made by the pilot gave a clue to his identity. It is believed that the hero of this feat is Pilot-Ofﬁcer Kenneth Gray, who was a schoolteacher before he entered the Royal Air Force. He is a son of Mr. and Mrs. R. L. Gray, Gisborne, but he severed his connection with the teaching profession to take up the airman’s life while he was in Wanganui. The word “nitwits” was a favourite one with Kenneth Gray. This, combined with the fact that he was formerly a schoolteacher and that, though he enlisted from Wanganui, his parents are living in Gisborne, suggests that he is the hero of the exploit. Anyway, the description ﬁts nobody else connected with Gisborne. TWIN-BROTHER ALSO IS IN R.A.F. Kenneth Gray is a twin. The other twin is also in the Royal Air Force as Pilot-Officer Colin Gray. Kenneth joined the Royal Air Force two years ago when he was teaching at St. George’s School, Wanganui. Colin also applied for entry into the R.A.F. at the same time. 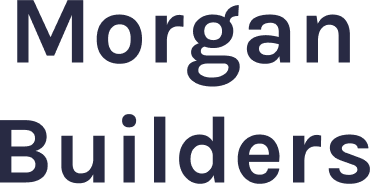 He was with a mercantile ﬁrm in Napier. At the time, however, he was turned down, but so keen was he to follow the air as a career that he went on to a sheep-farm for the purpose of building up his health so that he might qualify. He was classed as ﬁt about a year ago and went to England to join his brother. They both made good progress, Kenneth being drafted to a bomber squadron and Colin to the ﬁghter section. 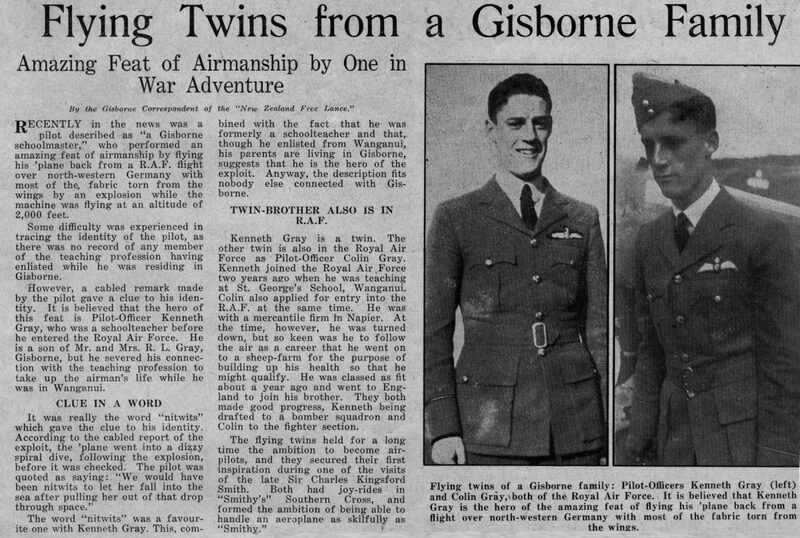 Photo caption – Flying twins of a Gisborne family: Pilot-Officers Kenneth Gray (left) and Colin Gray, both of the Royal Air Force. It is believed that Kenneth Gray is the hero of the amazing feat of ﬂying his ’plane back from a ﬂight over north-western Germany with most of the fabric torn from the wings.